Browse » Home » Swagbucks » Earn triple the Swag Bucks! Earn triple the Swag Bucks! Tomorrow is Friday! Time to celebrate, get pumped for the weekend and search your way to extra large SB bills. That's right, it's Mega Swag Bucks Day. Simply use the Swagbucks search engine for all your online searches, and you will have better odds of winning larger SB amounts starting at 20 SB and more. And at the Shop & Earn area, you can earn Swag Bucks just by using their link when you purchase online. If you purchase things at Walmart.com, here's a great deal for you! 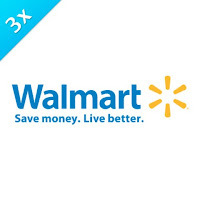 You can now earn triple the Swag Bucks on Walmart purchases through March 31st. That's 6 SB for every dollar you spend at Walmart. This is a great way to get more value out of your online shopping. And there's another Walmart promotion going on. If you snag a $5 Walmart gift card at their Rewards Store and make an eligible Walmart purchase on Shop & Earn by March 31st, you'll receive 50 SB on your account. The 50 SB rebates will be applied to your account by April 7th. What a great way to stretch your Swag Bucks and earn even more!